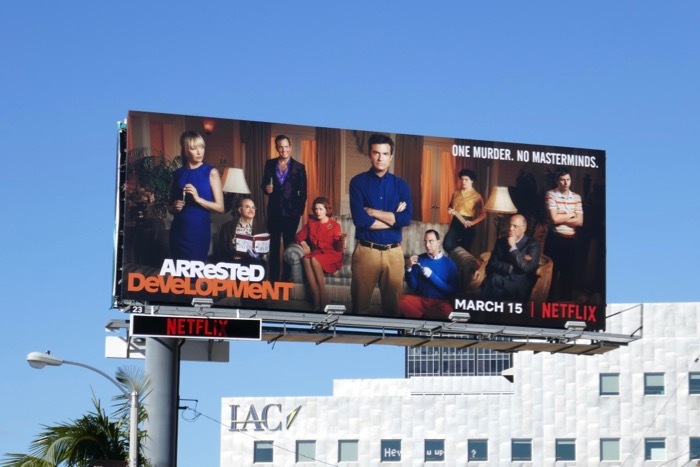 Five years ago cult comedy favourite Arrested Development was being revived for a fourth season on Netflix. 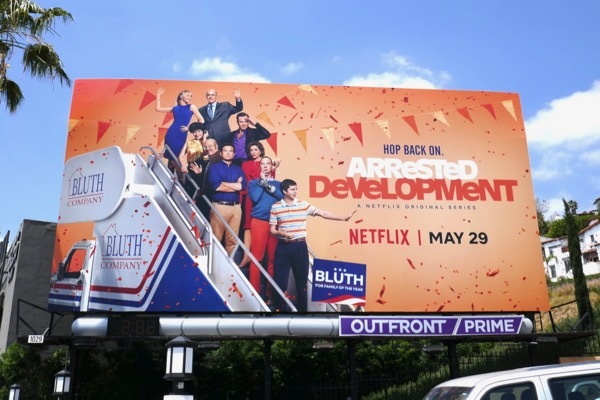 Now the show is back with all-new episodes, although the fifth season is being split into two eight episode halves, the first collection arriving on May 29, 2018. 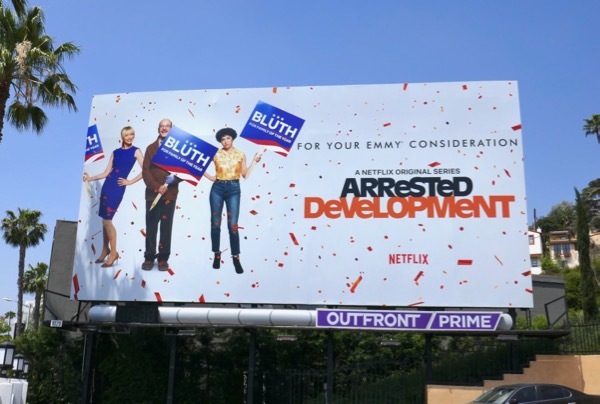 Portia De Rossi, Jessica Walter, Jason Bateman, Michael Cera, David Cross, Tony Hale, Alia Shawkat, Will Arnett and even the controversially fired Transparent star, Jeffrey Tambor, return as the flawed, narcissistic 'Bluth' family. 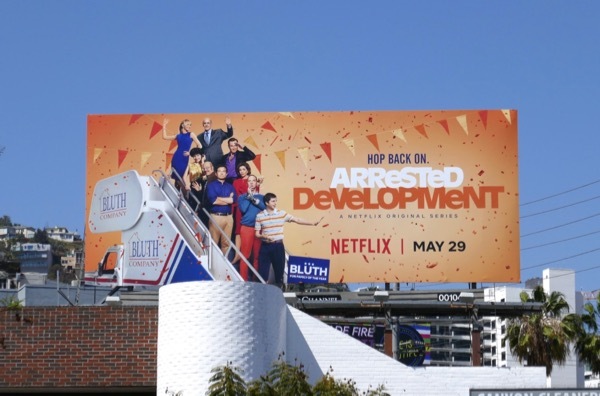 This time we're promised more group interactions rather than individual character journeys, but the usual subversive comedy with more murder plots, fathers and sons dating the same person and family members running conservative congressional campaigns. 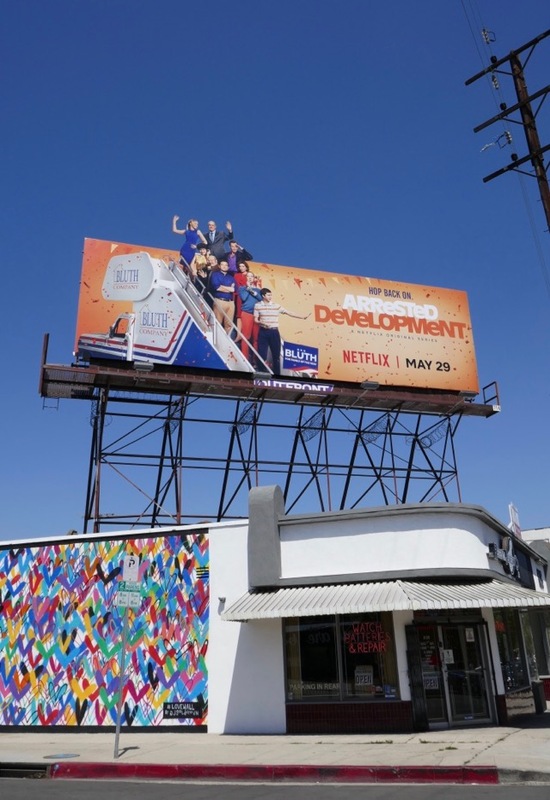 These fun fifth season billboards were spotted along Melrose Avenue, Sunset Boulevard, Santa Monica Boulevard and 3rd Street from May 10 to May 15, 2018. 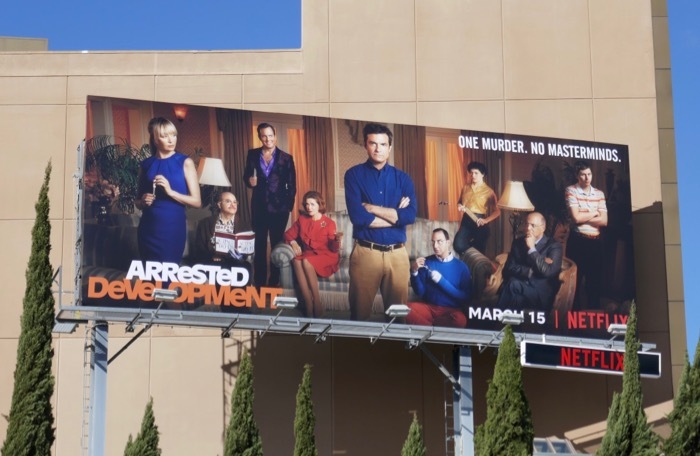 Fans of the show can also enjoy these Netflix revived season four billboards for Arrested Development from 2013. 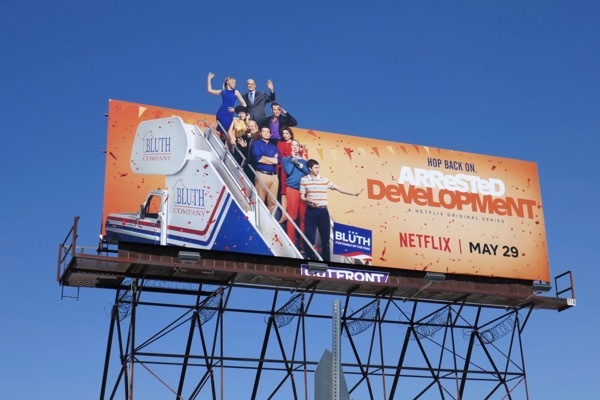 After waiting five years Daily Billboard is sure fans will be thrilled with eight new episodes, but don't binge them too fast, although at least you won't have to wait another five years for the rest. 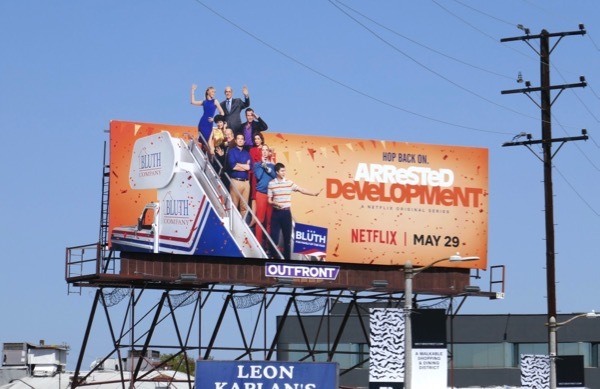 UPDATED: Wasting no time to appeal to TV Academy voters, here's an Emmy consideration billboard for this season of Arrested Development snapped above Santa Monica Boulevard at La Cienega Boulevard on May 22, 2018. 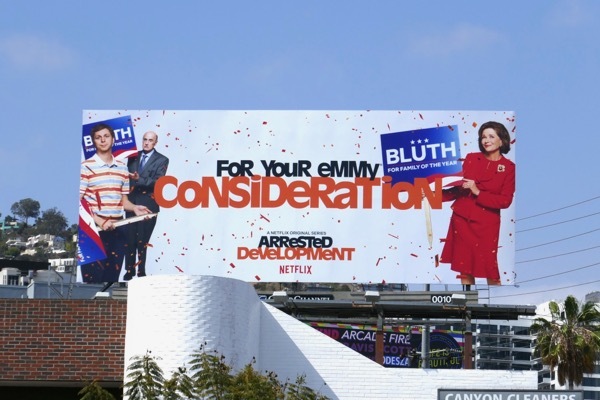 Plus here's another Emmy FYC billboard with more of the Bluth family spotted along the Sunset Strip the next day. 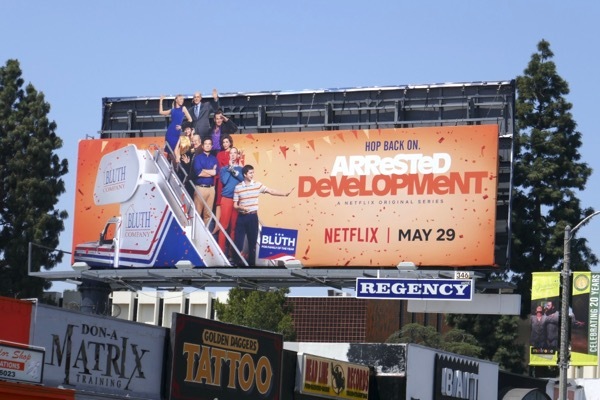 And here's yet another Emmy billboard with the rest of the cast snapped along the Sunset Strip on May 28, 2018. 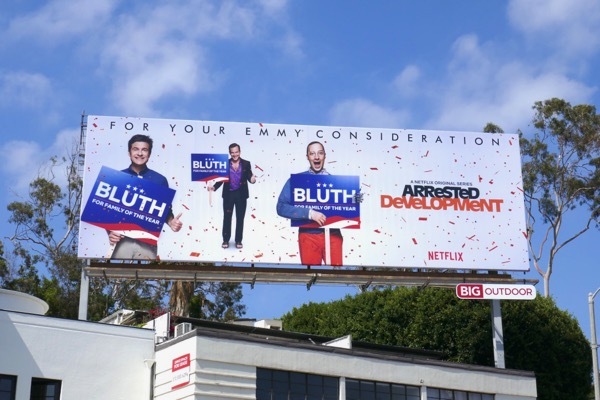 Although after all the controversy with Jeffrey Tambor's on set antics verbally harassing Jessica Walter, and her male co-stars defense of the actor, maybe the returning comedy won't be such an Emmy voter favourite. 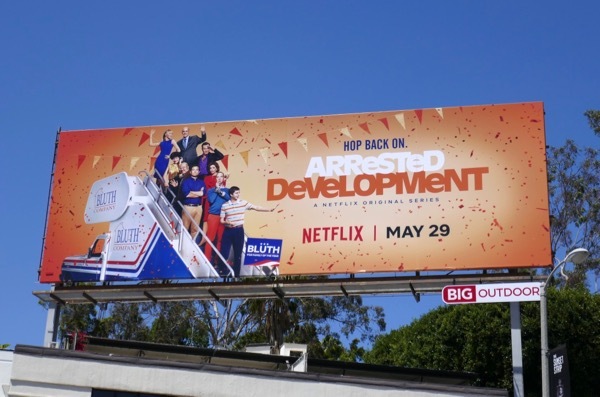 UPDATED: Here are also two billboards for the second half episodes of Arrested Development's fifth season on Netflix. 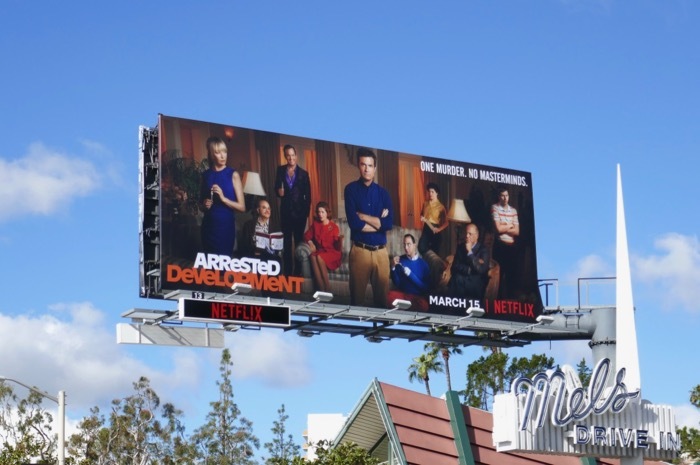 These billboards looking like a veritable whodunit scene were snapped along the Sunset Strip on March 4, 2019. 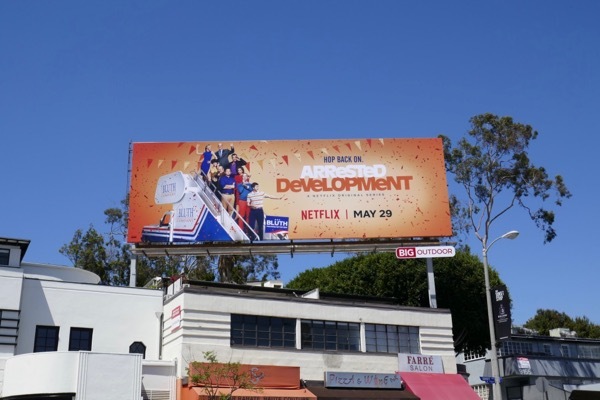 And here's another example of the midseason billboard spotted westbound along the Sunset Strip on March 12, 2019.